In this buyer’s guide, we provide you with the information that you need to select the best WordPress Shopping Cart Plugin for your small business. We looked at the most popular options and rising stars and decided to review Ecwid, WooCommerce, and Cart66. These companies covered the range for small businesses in terms of of price, selling tools, and ease of use. Read on for our comparison and review of these three options, as well as our top recommendations. Ecwid is our top pick because it’s affordable, simple to use, and allows you to sell just about anywhere. This includes WordPress sites, marketplaces like Ebay and Google Shopping, Facebook, and many more. Ecwid also integrates with many popular point-of-sale systems. There is a free basic version, and premium paid plans start at only $15/month. As a seasoned WooCommerce user, I surprised myself by placing Ecwid in the number one spot. But its mix of great features including intuitive setup, checkout security, multichannel selling, and point-of-sale integration makes Ecwid really stand out. If you’re interested in selling on WordPress and beyond, Ecwid is hands-down the best WordPress shopping cart plugin you’ll find. A major plus in Ecwid’s column is its multichannel selling features. Many of today’s successful sellers list products on social sites like Facebook, in marketplaces like Ebay, and sell in physical settings, too. With Ecwid, these multichannel connections are already built-in, so you can sell virtually anywhere from Ecwid with ease. For store building, Ecwid and our other top picks integrate well with WordPress to let you list products, build a storefront, and fully manage online sales. But of the three, Ecwid’s user dashboard is the most intuitive and easiest to learn for all of these functions. And if you can’t figure something out? Everything from basic setup to advanced features is well documented in Ecwid’s knowledgebase and video tutorials. One terrific feature Ecwid shares with Cart66 is a secure checkout, meaning it meets stringent PCI compliance standards. This takes the responsibility for credit card security off your plate. In contrast, WooCommerce leaves checkout security up to the store owner. Another plus for both Ecwid and Cart66 is that they work with most WordPress store themes, even free ones. WooCommerce can be used with most themes, but works best in compatible themes. WooCommerce is the most popular WordPress shopping cart plugin and powers roughly 37% of all ecommerce websites. That’s all ecommerce sites, not just those on WordPress. It’s one of the first WordPress shopping cart plugins developed and offers an amazing array of features for Free. Though you get a lot of power in WooCommerce’s free version, most users find it’s not really free to operate. Many simple tasks, like printing an order invoice, require extensions or additional plugins that can cost from $29 to $129 per year. To make it all work, most small businesses will need to add at least a few plugins, ensure they’re compatible, and keep them updated. Experienced WordPress users will have no problem with this, but a small business owner new to WordPress can find the learning curve steep. This is where Ecwid pulled ahead. That said, with extensions, add-ons, and plugins, WooCommerce can expand to sell just about anything. Plus it integrates with many seller marketplaces, store management tools, and point-of-sale systems. In contrast, Cart66 offers few integrations. For payment processing, WooCommerce works with an array of payment gateways. But unlike Ecwid and Cart66, checkout security is up to you. For this reason, PCI compliant payment processors Stripe and PayPal are good choices for small businesses using WooCommerce. One big plus for WooCommerce is it’s fully scalable. That means it can grow as big as you can dream. 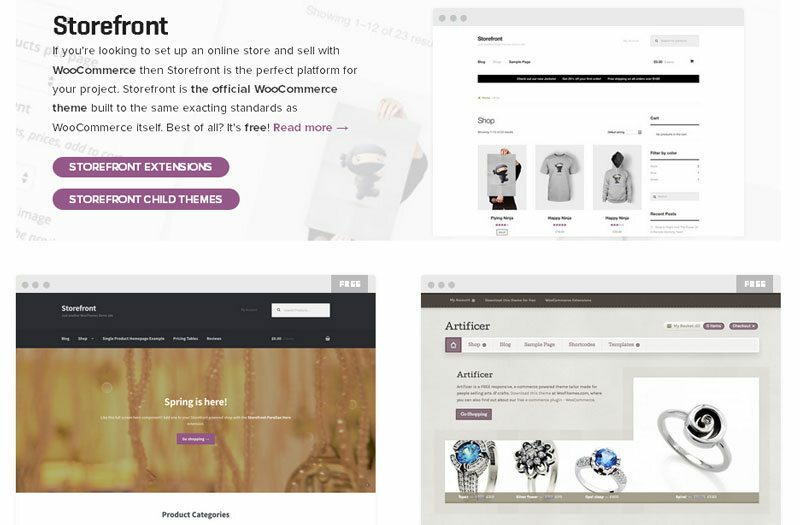 And for store design, there are plenty of gorgeous WooCommerce-ready store themes available, including free themes from WooCommerce. Cart66 tipped the scales into the top three because it doesn’t rely on outside integrations to create or manage a WordPress store. Plus it works well with any WordPress theme. With Cart66, you can turn any WordPress post or page into a sales page by adding a simple “Add to Cart” button. You also can add any type of media to product pages, including galleries, video, and sliders. This isn’t easily done in Ecwid or WooCommerce. Though simple to set up, the Cart66 product features are every bit as powerful as Ecwid and WooCommerce. It supports options like size and color, and pricing variations like quantity discounts. Cart66 also lets you sell many types of products, from physical and digital products to memberships and subscriptions. All store and order management tasks, such as printing orders, tracking inventory, and printing shipping labels are handled from the intuitive Cart66 dashboard. The last is an especially nice feature since Ecwid and WooCommerce require external services to print shipping labels. From the dashboard, you also can access great how-to articles and video tutorials that cover anything you need to know to set up and run your store. Another reason Cart66 made the top three is that it, like Ecwid, provides a secure checkout. That means its checkout process meets stringent PCI compliance standards and takes credit card security off your plate. With WooCommerce, checkout security is up to you. Like the other two, Cart66 supports social selling on Facebook, Twitter, and even through email, but it doesn’t offer any marketplace integrations. And, unlike Ecwid and WooCommerce, Cart66 doesn’t have a free version. Instead, it offers two very budget-friendly plans, $9.99/mo. and $29.99/mo., each with a 14-day free trial. The secure checkout alone is worth the price. Pricing is always a factor for businesses, but free isn’t a bargain if it comes with limited capabilities or efficiency headaches. Both Ecwid and WooCommerce offer free versions, while Cart66 does not. But you can extend functionalities on all with additional fees. That said, each of these powerful ecommerce plugins let you create fully functioning stores ranging in cost from Free to just $99/mo. It’s a pretty budget-friendly bunch. Ecwid’s free basic version is limited to ten product listings, and includes a Facebook store. You’ll need a paid version to list more than ten products and access additional features like marketplace selling, coupons, and inventory management. For busy stores selling on many channels, the time saved using Ecwid’s all-in-one management system is well worth the cost. The $35/mo. plan for 2,500 products is ideal for most small businesses, and includes marketplace selling. If you have a physical store, the $99/mo. plan allows unlimited products, plus it unlocks point-of-sale integration with Clover, Square, and Vend. WooCommerce is free, and you get a lot for that price! But be prepared to purchase a few extensions or additional plugins to make it all work for your specific needs. Things that can add costs include: integrations with point-of-sale and order management tools, and advanced features like tiered product pricing. On the plus side, you only pay for the features you need. WooCommerce extensions run from $29/yr. to $149/yr. for most extensions. With just two price levels, $9.99/mo. and $29.99/mo., Cart66 is a very budget-friendly WordPress shopping cart plugin for all that it offers. Enjoy checkout security, social selling, robust product features, excellent tutorials, and more at the lower monthly fee. Add subscription and membership sales and other advanced features at the higher fee. Plus you can try it free for 14 days, no credit card required. Themes are what drive the look of WordPress sites, and some ecommerce plugins work better with certain themes than others. Cart66 is no-holds-barred when it comes to theme compatibility. It loves them all. Ecwid works in most themes without any needed customization. WooCommerce really needs a compatible theme, but there are plenty available since it’s so popular, including free themes from WooThemes. Ecwid works with almost any WordPress theme, including our top theme pick for customization, Divi. If you already have a blog, you can easily add a store section using Ecwid, and it will use existing settings for colors, navigation, and headers. You also can find many store themes designed specifically for the Ecwid plugin. These let you create beautiful, full-featured storefront websites even if you’re new to WordPress. WooCommerce will work on most WordPress themes but may not automatically match the look, so a compatible theme is best. Since it’s the most popular ecommerce plugin for WordPress, there are compatible themes aplenty. WooThemes offers well designed free themes, plus some lovely designs at reasonable prices. You also can find a huge selection at Themeforest.com, or try our pick for highly customizable ecommerce themes: Divi by Elegant Themes. Cart66 works in any WordPress theme — free, paid, customized, the sky’s the limit. This ecommerce plugin is a bit different than the others since it adds store functionality within the WordPress architecture. This is what the pros call a “lightweight” solution. For you and me, that means we can use Cart66 on any WordPress site with lightning-fast load times. Both Ecwid and Cart66 are simple to set up and offer great step-by-step video tutorials that detail the process. Ecwid even provides a free setup call on all plans. WooCommerce is a bit more challenging, but many new WordPress users have tackled WooCommerce very successfully. It just takes patience to conquer the learning curve. Ecwid has a step-by-step setup tutorial and every account, even free ones, receive a setup phone call to get you up and running. Its tutorials and how-tos are very useful for digging into the details, such as how to add product options and pricing variables. And if you have a brick-and-mortar store running Clover, Square, or Vend for payments, you can connect your entire stock list and download items into Ecwid. Sweet! Setting up WooCommerce is not overly difficult, but there’s a definite learning curve if you’re not familiar with WordPress. Tutorials and some videos are available, both on the WooCommerce site and through other sources. Plus there are entire blogs and YouTube channels dedicated to working in WooCommerce. These can be better than the WooCommerce how-to’s, which are rather technical. Compared to Ecwid and Cart66, learning to add product options and manage detailed inventory takes some work. But for the price (Free! ), it can be worth the effort to learn. Cart66 takes just moments to install and set up. Don’t have a moment? They offer a $99 “Launch Pack” that sets up everything for you. Just add your product information and you’re set to sell. However, you can certainly do it all yourself using their terrific setup and advanced features video how-tos in their knowledge base. This is one of the reasons I placed Ecwid ahead of WooCommerce. Ecwid makes multichannel selling a breeze, it’s simply made for it. The other two get the job done in their own way, but neither meet Ecwid’s built in features. Since efficient multichannel selling is key to online success for many small businesses, in this, Ecwid is the leader of the pack. Ecwid: Ding, ding, we have a winner! Want to easily sell anywhere and everywhere? On one or several WordPress stores, on Facebook, Ebay, Google Shopping, and more? Ecwid is your WordPress shopping cart plugin. Your one Ecwid store feeds your product and inventory database to any and all of these selling channels. Plus it works seamlessly for in-store selling with point-of-sale systems Clover, Square, and Vend. With integrations, additional extensions, and plugins, you can sell most anywhere using WooCommerce. But versatility comes at a cost. Many sellers pair WooCommerce with a back-end store manager like StitchLabs (starting at $199/mo. ), or Ordoro (starting at $99/mo. ), to manage multiple sales channels. Another downside vs. Ecwid, WooCommerce only works in one WordPress site. If you want multiple stores, say for targeting unique niche markets, you have to set up and manage multiple WordPress sites. Like WooCommerce, the Cart66 store only works in one WordPress site. 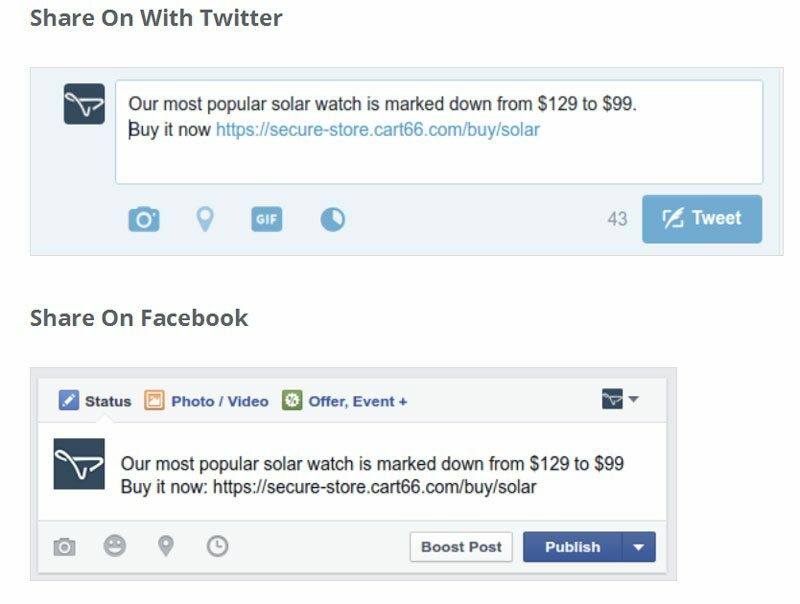 But you can easily sell unlimited products on Facebook and Twitter posts or turn emails into selling tools using their clever “Buy Now” button creator. Aside from that, Cart66 really doesn’t support marketplace or multisite selling. What they do offer is pretty nifty though for small niche and specialty businesses. Here is where both Ecwid and Cart66 top WooCommerce. Both provide top-level security on their checkout pages and ensure 100% PCI compliance, so you don’t have to. This is a nice feature that’s definitely worth the monthly fees. WooCommerce leaves it up to you, but there are ways to remove the burden. Read on for details. Ecwid: All shoppers check out on Ecwid’s PCI DDS validated Level 1 secure checkout which removes all worry. Whatever payment processor you use, Stripe, PayPal, or other integrated payment gateway, every transaction is handled securely. Unlike Ecwid and Cart66, WooCommerce leaves checkout security up to you. That’s why secure all-in-one payment processors like Stripe and PayPal are used by so many WooCommerce sellers. WooCommerce does integrate with several major payment gateways, and some offer more built-in security than others. With these, be prepared to understand what PCI compliance means and make sure your payment processing choices are compliant. For small businesses using WooCommerce, we recommend playing it safe with Stripe or PayPal. Like Ecwid, all Cart66 store shoppers checkout on the PCI-compliant Cart66 secure checkout which removes your credit card security worries. Whatever payment processor you use, Stripe, PayPal, or other integrated payment gateway, every transaction is handled securely. Again, Ecwid and Cart66 top WooCommerce in tools and support to get you up and running fast. Of the three, Ecwid offers the best support, including phone support on top plans — yay! Cart66 has paid phone support, which I didn’t purchase, but my support ticket emails were all answered within 30 minutes. Not bad. WooCommerce offers support if you purchase something, which I did, and my help tickets were answered within a few hours. Ecwid offers a new account setup phone call for all plans, even the free version. Their online knowledgebase and helpful video tutorials clearly explain every setup and store management feature. If you need more help, the paid plans all include support via chat ($15/mo.) or chat and phone ($35 and $99/mo.). I set up a phone appointment, was called promptly, and had all of my setup and order management question answered in minutes. With WooCommerce, you’re rather on your own. The good news is anything you want to do is documented somewhere in their vast knowledge base, you just have to find it. If you purchase at least one theme, extension, or plugin, you can submit support tickets. I did this and got answers, but it took some time. I found other sources like YouTube and WooCommerce bloggers to be just as helpful on tricky issues. But for basic store setup and use, WooCommerce help pages will get you going. Best video tutorials, period. Not only will the videos get you up and running on Cart66, they include a wealth of information about WordPress and ecommerce in general. Most video tutorials accompany a blog post with clear step-by-step instructions. They provide email support tickets and also offer a $99 Launch Pack store setup service. This is a great deal for busy store owners. These are details you don’t think about until you sell items with options, like color or size, or products with special pricing, like quantity discounts. Then, a lack of product features in a plugin is a big deal, indeed. All top three picks are handy when it comes to products with options, and can support special pricing needs as-is, or with a plugin. 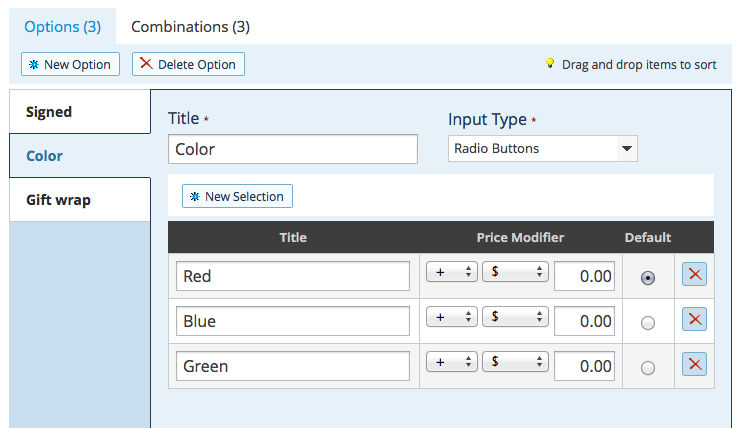 Ecwid makes single product options (like Colors) and combination options (like Color/Size/Style) very easy to set up. You can even track inventory at the combination level. For example, if you sell white hoodies and have: 1 white/large hoodie and 4 white/medium hoodies, that’s how Ecwid tracks it. You also can show images for each option/combination, apply surcharges for options, and add personalization text boxes in the same screen. Ecwid has robust product pricing features that are very simple to use. You can set up discounts based on purchase quantities (called tiered pricing) which allows you to discount items in quantities, like 1 for $5 or 2 for $8. You also can add a surcharge when an option is chosen and add gift wrapping charges on a per-item basis. The free WooCommerce plugin includes a robust product options function called variables, but it comes with a learning curve. With it, you build sets of item options, like “Red, Yellow, Blue” or “Small, Medium, Large.” These are called attributes. Attributes are combined as variables, which let shoppers select multiple product options. “Red Small, Red Medium, or Red Large” are examples of variables made using attributes. 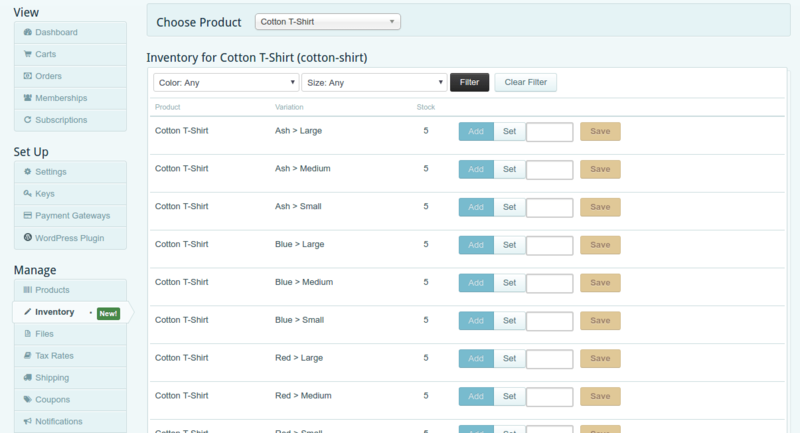 Like Ecwid, WooCommerce tracks inventory at the single option or variable level. For example, if you sell white hoodies and have 1 white/large hoodie and 4 white/medium hoodies, WooCommerce tracks it that way. You can also include images for each option, add option surcharges, include text entry for custom items, and much more. The free version will let you add surcharges/upcharges on product options. But if you want to create discounts based on set quantities, for example, buy 1 for $5 or 2 for $8, you’ll need to purchase an extension or try various plugins. Cart66 supports both single product options (like Color) and combination options (like Color/Size/Style). These are very easy to set up. Like Ecwid and WooCommerce, Cart66 tracks inventory at the option/combination level, too. You also can apply additional costs or surcharges to options and include text box entry for personalized items. With Cart66, you can easily apply surcharges to options and create quantity-based discounts for items purchased in set quantities. For example: Buy 1 for $5 or 2 for $8. Ecwid, WooCommerce, and Cart66 all offer order promotion features such as coupons and free shipping. Where they differ somewhat is in their order management tools. Within the dashboards of all three, you can set discounts and special offers, plus manage orders, customer updates, returns, and more. Each just handles it all a tad differently. Ecwid lets you control order features such as coupons and free shipping offers, and functions like order lookup, customer contacts, and returns in their sleek WordPress dashboard. With the help of a free app for paid accounts, you can make changes to orders. With a paid app ($7.95/mo. ), you can print customized packing slips and invoices from your management dashboard. WooCommerce includes several powerful order features in its free version, including coupons and free shipping options. To print invoices or packing slips directly from your dashboard, you’ll need to install an app or print them through your integrated shipping or order management software. WooCommerce stores orders in the WordPress dashboard, making it very easy to search and review orders, make changes, cancel orders, and process returns. Stripe, PayPal, and some integrated payment gateways let you process refunds from your dashboard, too. Cart66 offers simple but useful promotional features and order management tools. One of their greatest benefits is the variety of products and services you can sell, such as physical and digital items, subscriptions, memberships, and donations. You can create coupons and offer free shipping, too. Unlike Ecwid and WooCommerce, order management takes place in the Cart66 dashboard, not in WordPress. There you can review and manage orders, look up and contact customers, process returns and automated billing for services, and print packing slips, invoices, and even shipping labels. Each has a highlight in this section. Ecwid wins in inventory management across multichannel sales. WooCommerce, combined with back-end systems, lets you manage volume sales. Cart66 provides easy in-dashboard inventory updates for smaller stores. Ecwid handles inventory across all of your selling channels beautifully because it all tracks in one central inventory database. You can manage inventory for all items, including those with several options. You can update inventory in a few ways, too. Manually, using Ecwid’s bulk updater app, or through file uploads. 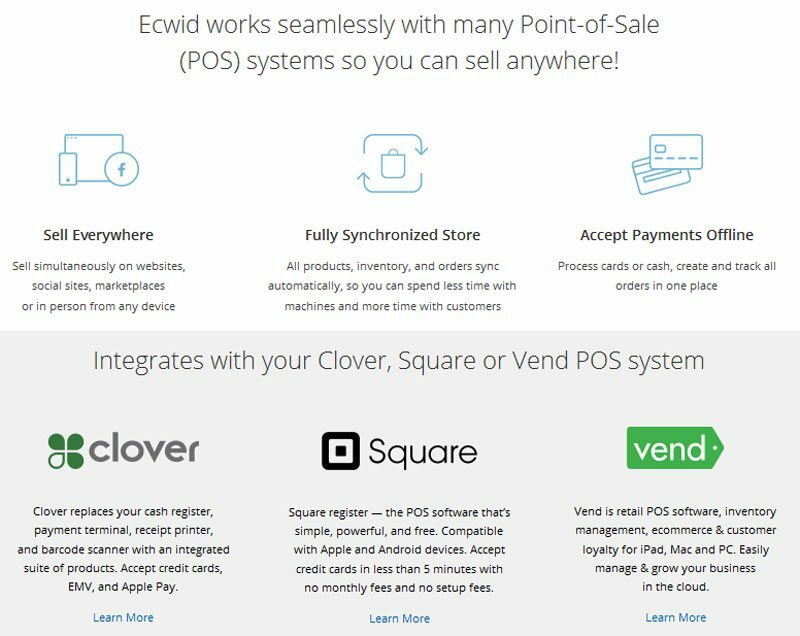 If you run a physical store using Clover, Square, or Vend, Ecwid can connect your inventory between your store and online channels. Plus you can set inventory to show availability on your online selling channels. When out of stock, Ecwid makes items unavailable, preventing backorders. WooCommerce tracks inventory down to the last detail, but updating it all manually every time a restock order arrives can be a chore. You can cobble together plugins to manage it all, but most WooCommerce users turn to integrated systems. StitchLabs, Ordoro, and ShippingEasy are a few that manage inventory for WooCommece. You also can set inventory to show availability for items and, unlike Ecwid or Cart66, allow or disallow back orders. This is a good feature for sellers who are set up to manage back orders. Cart66 tracks inventory in detail for both base items and at the item/option level. It’s very easy to update stock counts manually in the Cart66 dashboard. You can list products as unavailable as needed, and Cart66 won’t let you oversell products without available stock, preventing back orders. Only one plugin, Cart66, offers shipping rate comparisons and shipping label printing within its dashboard. Ecwid and WooCommerce both require integration with shipping management systems, but that’s not necessarily a bad thing. Several shipping management providers make the shipping process efficient and help you find the lowest rates. Most are budget-friendly and some even offer free plans. Most Ecwid stores turn to multi-shipper systems such as ShipStation or ShippingEasy to compare carrier rates and print shipping labels. Both connect seamlessly to Ecwid to access order and address data. You do have to log into shipper websites to process orders, but they’re designed to save you both time and money. Once orders are shipped, package tracking information is uploaded into Ecwid and customer email notifications are sent. WooCommerce integrates with a number of shipping label tools, so you definitely have a choice. Most busy stores turn to rate comparison systems like ShipStation, ShippingEasy, or my pick for WooCommerce stores: Ordoro. Each imports orders from WooCommerce, then lets you compare rates and print labels. Once orders are shipped, package tracking information is uploaded into WooCommerce and customer email notifications are sent. Of the three top picks, Cart66 is unique in how it handles shipping labels. It integrates directly with EasyPost, a very sleek multi-shipper system. It allows you to process orders and print shipping labels right from your Cart66 dashboard. Of the three, this is the most integrated and easy-to-use shipping label printing option. Integrated store management tools tie all operations together in one system: purchase orders, inventory, drop ship orders, multiple warehouses, shipping, sales reporting, and more. Not every store needs this, but if you do, it’s nice to know it’s available and that your website readily integrates. You can manage orders and inventory for every selling channel you use in your Ecwid store manager. 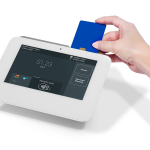 Or you can connect your online and in-store sales via Clover, Square, and Vend point-of-sale systems, which can provide added inventory features. If you don’t use a point-of-sale system, but need to track purchase orders, drop ships, or outsourced fulfillment, you can pair Ecwid with an advanced inventory system like Finale Inventory. Ecwid’s sales reporting tools are rather sparse. Most users connect their store to Google Analytics Ecommerce Reports (Free!) to provide a wealth of reporting data. Learn how to get started here. Of the three, WooCommerce is the most scalable solution when you pair it with a powerful back-end store manager like Ordoro. With Ordoro, you can manage inventory, shipping, purchase orders, drop shipping, and multichannel selling needs all from one place. 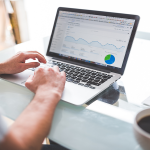 There are plugins aplenty for reporting WooCommerce sales and user activity, but the free Enhanced Ecommerce Google Analytics is hard to beat. You can easily manage every aspect of a small ecommerce store in the Cart66 dashboard. It gives you every tool you need without plugins or external services. That said, some things are handled manually and don’t offer much in terms of scalability; inventory updates, for example. But if you don’t have to update products that often, the all-in-one Cart66 order and shipping dashboard is very efficient. For reporting, Cart66 fully integrates with Google Analytics for all types of ecommerce sales and site visitor data. Ecwid Small Ecommerce & Physical Stores Adding Ecommerce $15 / month, $35 / month & $99/mo. with a Free basic version Ecwid is our top recommended WordPres Shopping Cart plugin. They are an easy, intuitive, secure plugin that lets you sell anywhere. WooCommerce Small, Mid-Sized and Large Ecommerce Stores Free. Additional features available with free and paid extensions and plugins The most popular WordPress shopping cart plugin, WooCommerce offers a lot of functionality for free! WP eCommerce Small, Mid-Sized, and Large Ecommerce Stores plus Subscription and Membership sites Free. Additional features available with free and paid extensions and plugins The second most popular WordPress shopping cart plugin, it gives you full design control over the look of your store, lets you sell all types of products, and provides great reporting. JigoShop Small and Mid-Sized Ecommerce Stores Free. Additional features available with paid add-ons JigoShop offers an intuitive setup and store management dashboard, plus many great, inexpensive, ready-to-go JigoStore themes. iThemes Exchange Small and Mid-Sized Ecommerce Stores Free. Additional features available with the ProPack add-ons for $197 iThemes Exchange supports both physical and digital item sales. It’s remarkably intuitive, making setup a snap. Both Stripe payments and PayPal Standard are fully integrated for secure checkout. Every online seller has a unique set of needs, and a universe of WordPress shopping cart plugins exists to meet each and every one. Sometimes the hardest choice is deciding which one to use because they all promise such possibilities. Taking everything into account, we landed on Ecwid as our top choice for small business because it does many things very well. It’s undoubtedly designed to help small business owners save their most valuable asset — time. Plus it covers the full spectrum of multichannel selling: online, social, marketplace, and in-store. It does this all from one management center, and at a very good price. Ready to give online selling with Ecwid or another great WordPress shopping cart plugin a try but don’t yet have a WordPress site? Set one up today using our quick-start guide here. Do you use Ecwid, WooCommerce, Cart66, or another great WordPress shopping cart plugin? Let us know what you think in our comments below. WooCommerce is awesome because you can use it anywhere. Most other tools offer some translation features, but the don’t offer features you need for example in The Netherlands. Think about local payment providers or local tax/law requirements. I tried Ecwid too, and for a service in the cloud it’s an amazing tool, but mostly developed for american based companies. I agree, Woo delivers an amazing suite and the ultimate in flexibility and international use — especially for such a low price. I really appreciated this breakdown! Thank you!